As a twin, I've been told numerous times how lucky I am and how other people wish that they, too, could be a twin. But, as a multiple, there are some things - both good and bad - that people don't understand about being a multiple. And, as an identical twin, there are even more things that people don't understand about having someone else who looks pretty much exactly like you. 1. You share the same birthday. CON: Yes, you share the same birthday. This also means that you most likely share the same birthday party. So, now you have to compromise on what you're going to do to celebrate your birthday. And, while I never really remember this being a problem for my sister and me on our birthdays, it could be a problem. After all, everyone wants their birthday to be special. PRO: You never have to worry about celebrating your birthday on your own. Even if everyone else forgets, your twin never will. It's also a great day to remember just how awesome your mother was to carry you and your sibling in utero. It couldn't have been easy. I've never been pregnant with multiples, so I can't comment on birthing them. But, I do want to say a huge thank you to all mothers of multiples. You are amazing women! CON: You look alike. Very few people can tell you apart. People confuse you ALL.THE.TIME. It's frustrating because, you're not the same person. You have physical differences that you wish people would notice. And, because they don't, they say stupid things like, "Do you ever confuse yourself with your twin?" Me: "No. Of course, I don't confuse myself with my twin. I'm not her. Do you ever confuse yourself with someone else??" Not only do twins have physical differences, but you also have different personalities, interests, likes and dislikes. And, while they may not always differ too greatly, they are still different. We are different people...stop treating us like the same person. PRO: You look alike. This means that it can be a lot of fun to play games on people. Granted, my sister and I didn't like doing this when we were younger. We wanted to be treated as individuals. But, as we aged, we found the fun in these games. We never took them too far...just a chance to see if our closest friends could actually tell us apart. They usually could! Looking alike also got us a lot of attention. This caused people to remember us - even if they couldn't tell us apart. It's kind of nice to know that people remember you. 3. It isn't all fun and games. CON: Even when you aren't playing games, people think that you are. I'll never forget walking through the 3rd or 4th grade hallway when my sister's teacher tried to pull me into her room - swearing that I was actually my sister and that I wouldn't get away with trying to play a trick on her. Just because we can play tricks on people, doesn't mean that we always do. Sometimes a little trust that we aren't playing tricks on you (especially if it's never been a habit with us), goes a long way. PRO: A lot of it is fun and games - and not just the tricks. We were born with a built-in playmate. And, while we may still fight like siblings (since we are siblings), we have a special bond that is indescribable and pretty amazing. 4. You don't know what it's like to be a singleton. CON: While so many people told me that they wish they had a twin, I was wishing that I wish I didn't. I just wanted to feel "normal" and being a twin isn't exactly normal. I didn't really realize just how much being a twin defined who I was and what I did until my sister and I went to two different colleges and were forced to start living life where people didn't meet us and recognize us as twins. There was a bit of a learning curve involved with this new stage in life. It wasn't always easy, but at least my sister was only a phone call away. PRO: If I had been born as a singleton, then I wouldn't have my amazing twin sister. My life would not - and could not - be the same. 5. It really is pretty cool. For all the reasons stated above, and so many more that I can't even begin to put into words, being a twin - or any multiple - is pretty darn cool. I don't consider myself lucky to be a twin...this would imply that I had some part in the process of becoming a twin. I have been blessed to be a twin. Scientists have been studying twins and other multiples for centuries...trying to learn about what makes us unique and what makes us different. Often times they use the phrase "nurture vs. nature" to describe many twin phenomenons. And, while this may describe a certain aspect of our lives, I also believe that there is a third concept that needs to be added to this phrase: a very specific combination (not separation) of our genetics and our twin experiences. 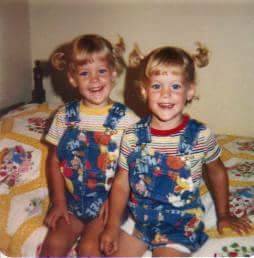 Because, without the genetics, it would never have been possible for us to have the uniquely twin experiences that we've had. As my final thought, I no longer wish to have ever been a singleton. No matter what happens in my or my twin's life, we are forever connected through our twin bond. It is something that has uncommonly shaped who we are. There is no going back. For this, I am grateful.